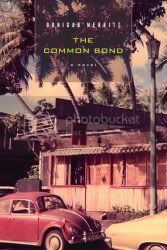 Unfortunately, I don't have a lot to say about Donigan Merritt's The Common Bond. The story is well constructed and the characters fleshed out nicely, but I had to trudge through this book. The prose in the first chapter was so heavy (I have no other way to describe it) that I almost gave up there, as I was afraid the rest of the book would be the same way. Luckily, I was wrong, but it was still a difficult read for me. The book revolves around Morgan and Victoria's relationship, or at least the impact their relationship has had on Morgan, as the book opens with Morgan grieving in an alcoholic stupor for the death of Victoria. Victoria did not have a happy childhood and found in Morgan the stability that she needed, but he still wasn't enough for her. After she takes her own life, Morgan returns to Hawaii, to recover and try to reconnect with himself. By the end of the book, he has come around and is beginning to find a new life for himself. However, with such an enigmatic ending, who knows how Morgan's story really ends. And maybe that's the point, but I guess I just like my stories to have something more of a concrete ending to them. The book is an interesting character study on so many levels; grief, doubt, guilt, love. All in all, I think there are too many conflicting emotions present throughout the book, which I think is what contributed to bogging down the story for me. However, it is still a well written book, and I think for the right reader, this would be a great book.